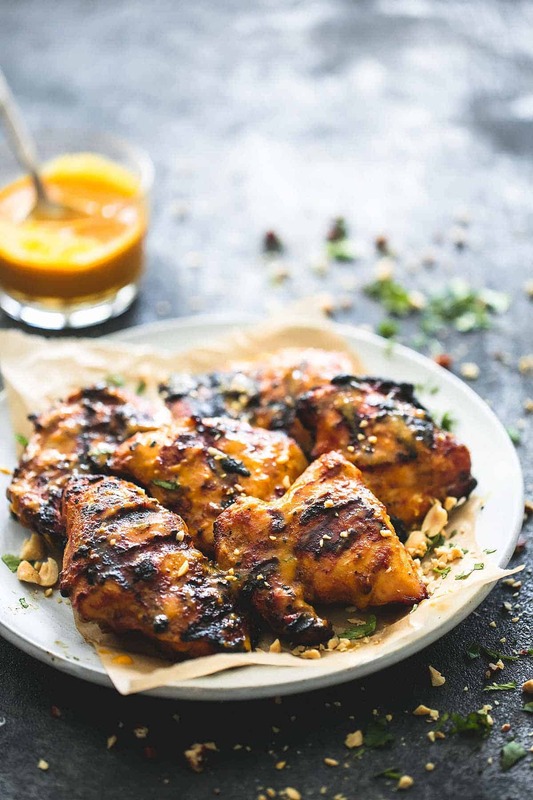 Easy marinated grilled thai mango chicken with a sweet and tangy coconut curry mango sauce to die for. aka. just some of the best, most incredibly tender and insanely flavorful grilled chicken I have ever encountered in my lifetime. For as long as I can remember I have loved mangoes. Love love love loved mangoes. And mango flavored everything. Smoothies, popsicles, chewy candies, gum. All of it. 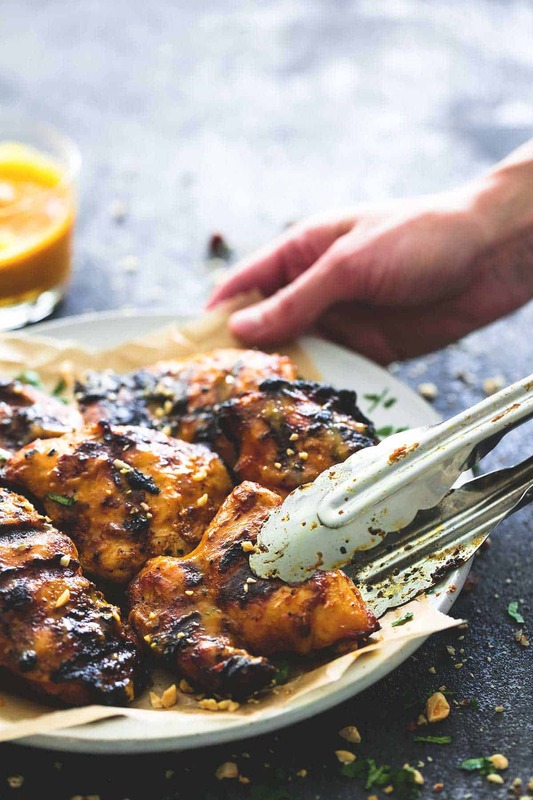 So serve me up a plate of grilled Thai mango chicken and I’m in heaven. I would tell you that I was inspired to make this dish by some crazy event or that it came to me like a brick to the head when I was washing my hair one morning, but the 100 percent truth is that this recipe kind of happened all on its own. We made a trip to Costco last week for one item, and left with four. One of those four items was a case of fresh mangoes. When I saw them piled high in the produce section I couldn’t resist. Looking back I wish I’d bought seven cases of them. But we live about 6 minutes from Costco so I think I could probably get my hands on a few more this week. Anywayyyyy our Costco trip landed a case of mangoes on my kitchen counter. A couple of days later I made a grilled lime coconut chicken (oh don’t you worry, it’s comin’ soon!) and used half of a can of coconut milk in the process. Fast forward another two days and I thoguht, you know I love coconut, and I love mango….. what if I just whipped up a mango coconut sauce for some chicken and see how it goes…..
Choirs of angels sang you guys. 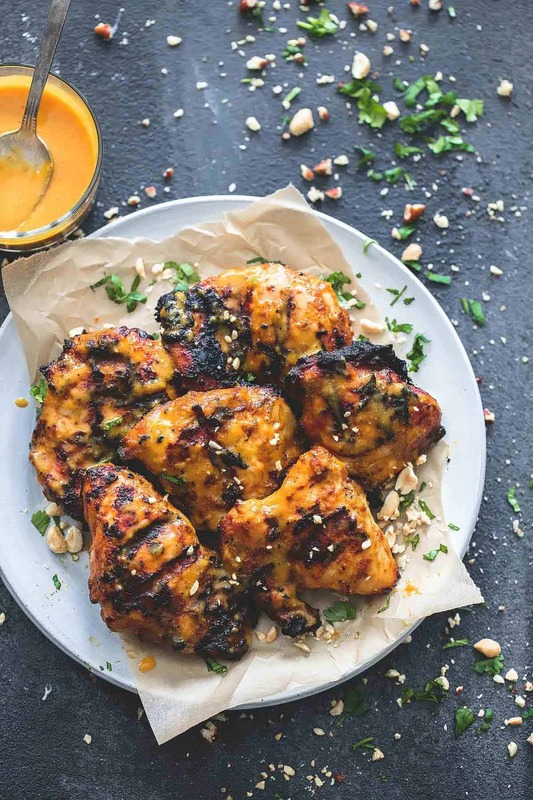 This chicken is made with my new favorite trick – doubling the marinade as a sauce. You make one sauce, marinate the chicken in most of the mixture, and save a little for later. When the chicken is cooking, you let the reserved sauce simmer on the stove for a few minutes and voila! 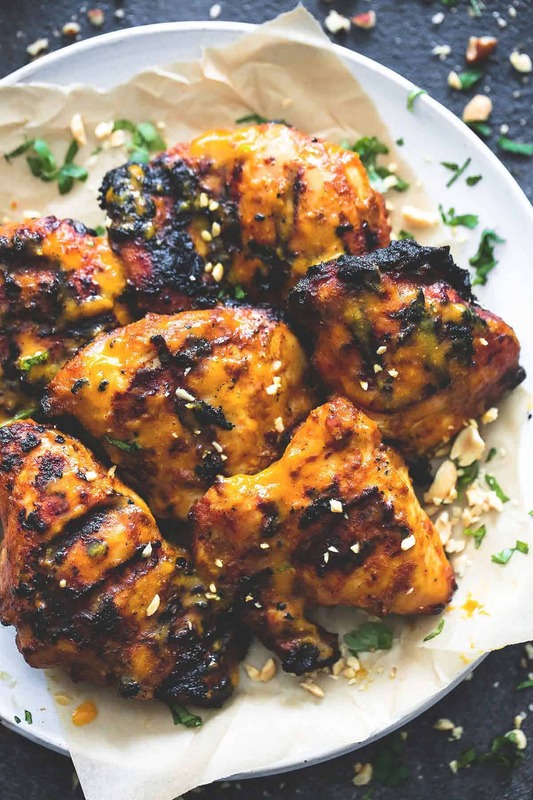 you’ve got a little extra for slathering all over your juicy lucy tender marinated chicken!! In a food processor or blender combine mangoes, coconut milk, salt, curry paste, curry powder, garlic powder, cumin, chili powder, lime juice, and oil. Pulse until smooth. Reserve 1/2 cup of the mixture, cover and refrigerate. Pour remaining sauce into a large resealable bag. Add chicken, seal bag, and refrigerate for 1-8 hours (overnight works great). While chicken is cooking, transfer the reserved portion of the sauce (the portion you refrigerated by itself) to a sauce pan. Bring to a boil over medium heat and cook 3-5 minutes, then remove from heat. Once chicken is just about cooked through, brush both sides with the sauce and allow to cook 1-2 minutes longer on each side. Serve chicken hot with any extra sauce and garnish with chopped peanuts and cilantro if desired. Prep and cook time does not include marinating time which is 1-8 hours. 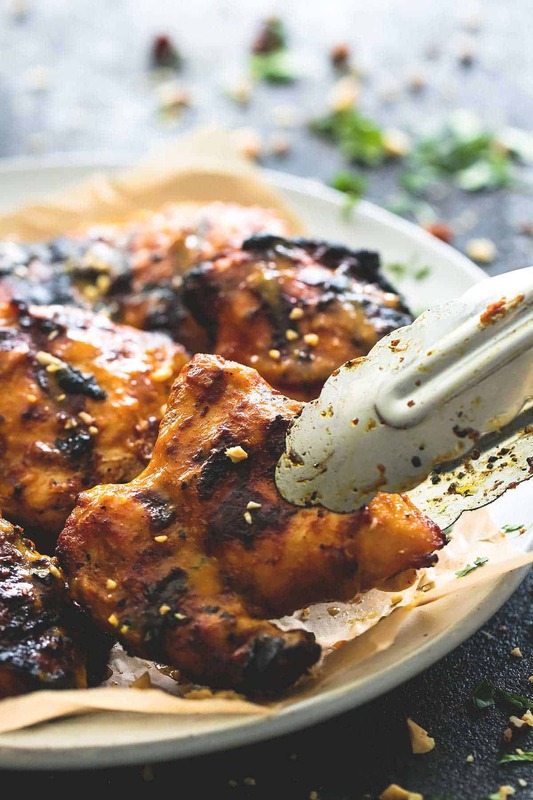 Try these other Grilled Recipes you'll love! Missed a key ingredient in your instructions Never wrote to blend the mangos in with the sauce. Tasty sounding recipe though. Oh snap, I just fixed it! Thanks Kim!! This sounds delicious!! Thinking of making it as one of this week’s meals. Also, I couldn’t seem to find it in the instructions, but does the mango get blended in the second stage of the instructions? What would you suggest serving this with? I was thinking rice, with a chopped tomato/cucumber/mango salad. hey girl this looks delish!! Holy drool. This looks incredible and SO full of flavor! A must-try, for sure. This was delicious and easy — The first time in a long, long time was looking forward to dinner!! 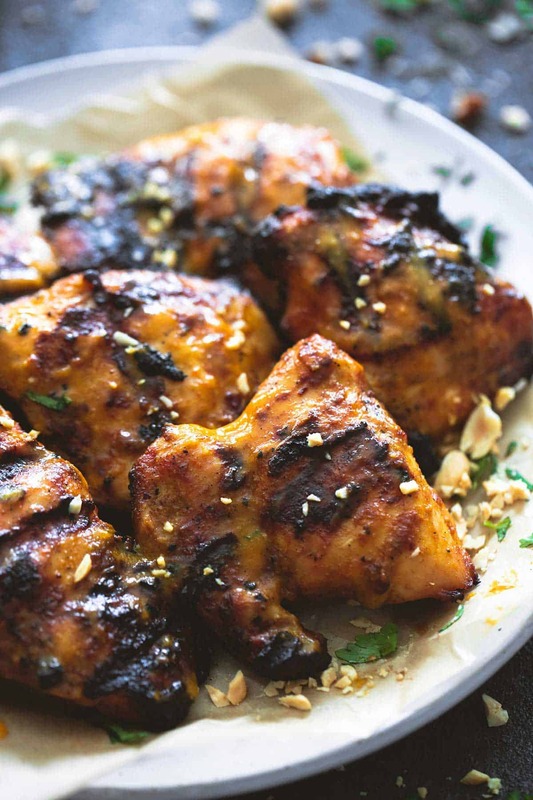 What a fragrant, mouth watering, tasty marinade! I had 6 thighs to marinade but I think I had enough marinade for 10 thighs and would have had enough to heat up and slather on/and dip into during the final cooking stage. I don’t know if I made a mistake or if my mango was just extra juicy — either way — it was so good. My husband loved every bite, as did I. I served this with the coconut rice recipe from hapanom.com and a mango, Persian cucumber, red onion salad with a Muscat orange vinegar, grape seed, cilantro vinaigrette dressing that I threw together. Don’t forget the peanuts and cilantro on the finished dish!!! This is a keeper, for sure.